Apex® 1'' square drive sockets, SAE, thin wall, 6 point and 12 point, standard length from Cooper Tools. Thin wall sockets accommodate countersunk or limited clearance nut or bolt locations. 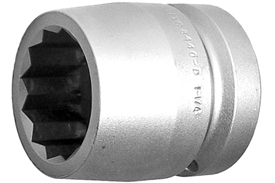 Many of these sockets have a shouldered body design that can fit in tight quarters.